Situated just off the seafront, opposite West Hoe Park, with distant views of Smeaton’s Tower, within easy walking distance of the City, the well loved Plymouth Hoe and less than a mile to the Brittany Ferries terminal. A long established, family run guesthouse where you are assured of a warm welcome from proprietors Max and Veronica. 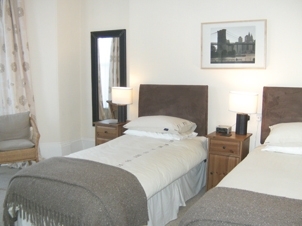 En-suite rooms, comfortable and well presented with neutral, modern colours. Enjoy a full English breakfast in the light and airy dining area. A short stroll along the seafront will bring you to the Barbican, the heart of Plymouth's long maritime history, from here the Pilgrim Fathers set sail on the Mayflower. Browse in the many art galleries, craft workshops and quirky speciality shops before stopping for a restorative tea or coffee in one of the area's quaint tearooms. You will find yourself spoiled for choice with restaurants and bars to suit every taste and budget where you can choose to dine inside or out. If you want to get away from the buzz of the City, a short ride will find you on Dartmoor (one of the largest National Parks in Britain) or a five minute ferry trip across the Tamar will take you into Cornwall. Free Wi-Fi in the rooms. Secure yard for parking upto six bikes. Plymouth is uniquely situated in the glorious South West on the English channel, where pleasure boats will take you round the Docks and Warships. The Tall ships races start here as do numerous sailing events throughout the year. Being a major fishing port, fish are landed and auctioned regularly at the market. Adjoining the market is the Aquarium, famous for having the deepest tank in Europe, housing species from tidlers to fearsome Tiger Sharks. Other places of interest include the Naval Dockyard, HMS Raleigh, the ancient Barbican with cobbled sheets, alleyways and lots of places to sit and watch Plymouth go by! A short ride to the rugged wilderness of Dartmoor National Park, with totally unspoilt moorland, breath-taking scenery, huge granite outcrops, rivers, streams and to admire the wonder of nature at her most awesome! Also a number of wonderful beaches in Devon & Cornwall, including Whitsand Bay and Wembury.